Psoriasis is an inflammatory skin disease in which activated immune cells and the proinflammatory cytokine TNF are well-known mediators of pathogenesis. The transcription factor NF-κB is a key regulator of TNF production and TNF-induced proinflammatory gene expression, and both the psoriatic transcriptome and genetic susceptibility further implicate NF-κB in psoriasis etiopathology. However, the role of NF-κB in psoriasis remains controversial. We analyzed the function of canonical NF-κB in the epidermis using CRE-mediated deletion of p65 and c-Rel in keratinocytes. In contrast to animals lacking p65 or c-Rel alone, mice lacking both subunits developed severe dermatitis after birth. Consistent with its partial histological similarity to human psoriasis, this condition could be prevented by anti-TNF treatment. Moreover, regulatory T cells in lesional skin played an important role in disease remission. Our results demonstrate that canonical NF-κB in keratinocytes is essential for the maintenance of skin immune homeostasis and is protective against spontaneous dermatitis. Psoriasis is a chronic inflammatory skin disease characterized by epidermal hyperplasia, altered keratinocyte differentiation, and inflammatory infiltrates (1). It remains unclear whether the primary defect fomenting psoriasis lesion development affects keratinocytes or immune cell function. In murine models, forced expression of inflammatory cytokines in keratinocytes produces lesions with characteristics of human psoriasis (2–4). Constitutive activation of several transcription factors that regulate the expression of inflammatory cytokines, such as STAT-3 or NF-κB in keratinocytes or immune cells, also can drive cutaneous inflammation (5, 6). The transcription factor NF-κB is a complex formed by dimerization of its subunits: p65 (RelA), RelB, c-Rel, p50, and p52 (7). The canonical NF-κB pathway culminates in activation of dimers of p65, c-Rel, and p50 subunits. Genome-wide association studies suggest a link between psoriasis and the NF-κB pathway (8) that is supported by mouse models. Ablation of the NF-κB inhibitor IκBα produces cutaneous inflammation and keratinocyte proliferation (6, 9). However, deletion of IKKβ, which mediates canonical NF-κB activation, produces a fulminant psoriasis-like disease in mice (10). Expression of an IκBα superrepressor in keratinocytes also results in a similar, although less severe, phenotype (11). These phenotypes are driven by TNF, because IKKβ-deficient mice lacking TNFR1 or treated with anti-TNF Abs do not develop the disease (10, 12, 13). Given that IκBα has NF-κB–independent functions in keratinocyte development (14), and IKKβ has direct effects on ERK and STAT1 activation (15–17), it is unclear whether the cutaneous inflammation in these mice is fully attributable to defective NF-κB activation. To directly examine the role of NF-κB in skin, we deleted RelA and c-Rel in keratinocytes. Mice lacking both subunits developed dermatitis with some psoriasiform characteristics, which was prevented by TNF blockade. Spontaneous remission was promoted by Foxp3+ regulatory T cells (Tregs). These results highlight a crucial role for canonical NF-κB in the maintenance of skin homeostasis. Keratin 14 (K14)cre, Relafl/fl, and c-Relfl/fl mice (18–20) were kept in specific pathogen–free conditions in the animal care facility at Columbia University. Experiments were conducted under Institutional Animal Care and Use Committee approval. Spleen and lymph node (LN) cells were isolated by mechanical desegregation in PBS + 3% FBS. Whole skin was minced, digested for 3 h at 37°C in DMEM (Life Technologies) with 1 mg/ml Collagenase IV and 1 mg/ml DNase I (both from Sigma), and strained. Cell suspensions were stained using the following Abs from eBioscience: TCR-β (H57), CD4 (RM4.5), CD8 (53-6.7), CD19 (Ebio1D3), CD90.2 (53-2.1), CD45 (30F11), CD44 (IM7), NK1.1 (PK136), TCR-γδ (EbioGL3), CD11c (N418), CD11b (M1/70), IL-33R (ST2), CD25 (PC61, 7D4), and Foxp3 (FJK16s). Foxp3 staining was performed using the eBioscience kit. Cells were acquired on a LSR II (BD Biosciences) and analyzed with FlowJo software. For quantitative RT-PCR (qRT-PCR), frozen tissues were dissociated using Lysing Matrix D tubes (MP). Total RNA was isolated using TRIzol reagent and reverse transcribed with Superscript III (Life Technologies). qRT-PCR with SYBR Green (Quanta Biosciences) was performed on a CFX96 or 384 (Bio-Rad); all values are relative to GAPDH. Primers sequences are available upon request. Ear or skin specimens were fixed with 4% neutral-buffered formalin for 4 d, transferred to 70% ethanol, and embedded in paraffin. Five-micrometer sections were cut, deparaffinized, stained with H&E or TUNEL, imaged using an Axio M2 (Zeiss) microscope, and processed using AxioVision and ImageJ software. Epidermal thickness was measured on ≥15 random fields/specimen; mean thickness is shown. Statistical significance was calculated using the two-tailed unpaired Student t test. The role of NF-κB in skin biology and pathophysiology remains ambiguous. Although mice lacking p65, cRel, and TNF exhibit defects in epidermal differentiation (21), it is not clear whether this is the result of a keratinocyte-intrinsic requirement for NF-κB. Therefore, we crossed mice carrying either floxed Rela or c-Rel alleles to a transgenic mouse expressing Cre under the control of the K14 promoter. K14creRelafl/fl (K14ΔRela) and K14crec-Relfl/fl (K14Δc-Rel) pups were born at Mendelian ratios and displayed reduced expression of Rela and c-Rel mRNA, respectively, in the epidermis (Supplemental Fig. 1A). Histological analyses showed normal epidermal thickness and keratinocyte differentiation (data not shown), indicating that deletion of Rela or c-Rel did not affect skin development. Next, we used 2,4-dinitrofluorobenzene to induce contact hypersensitivity. K14ΔRela and K14Δc-Rel mice exhibited increased ear swelling and TNF and IFN-γ expression compared with littermate controls (Supplemental Fig. 1C–F). Consistent with a recent study using mice lacking RelA in the epidermis (22), these data suggest that RelA and c-Rel have a nonredundant, keratinocyte-intrinsic, immunoregulatory role in skin. It was reported previously that RelA has a growth-inhibitory role in keratinocytes (23) and prevents keratinocyte differentiation (24). However, no changes were observed in epidermal differentiation upon keratinocyte-specific deletion of RelA. Therefore, to assess whether they are redundant in epidermal development, we deleted RelA and c-Rel in keratinocytes (double-knockout [DKO] mice), which led to a full ablation of RelA and minimal residual c-Rel in DKO epidermis (Supplemental Fig 1A, 1B). DKO pups were born at expected Mendelian ratios but exhibited visible skin lesion from day 5, which spread rapidly and covered most of the body by day 12 (Fig. 1A). Early lesions were well-demarcated, scattered, rigid, scaly plaques without edematous or exudative reaction. H&E staining revealed hyperkeratosis and focal parakeratosis, which are features of psoriatic lesions. Epidermal thickening and dermal and epidermal mononuclear infiltrates were observed (Fig. 1B, 1E). DKO mice exhibited apoptotic loci in all layers of the epidermis (Fig. 1F). Epidermal deletion of Rela and c-Rel drives psoriasis-like inflammation. Representative photographs (A and C) and H&E staining on skin sections (B and D) of WT and DKO mice 12 d (B and C) and 30 d (C and D) after birth. Scale bars, 100 μm. (E) Mean (± SEM) epidermal thickness from three to six mice/group/time point. (F) TUNEL staining on day-16 ventral skin. Arrows show TUNEL+ nuclei. Loricrin (G) and Keratin 10 (H) mRNA expression in whole skin 2 d after birth. (I) Epidermis was isolated from 14-d-old WT and DKO mice, and expression of S100A8, S100A9, Defb3, IL22, IL24, and IL1b was determined by qRT-PCR. All data are from three or more independent experiments. *p < 0.05, **p < 0.01, ***p < 0.001. n.s., nonsignificant. No lethality was observed; in >90% of the mice, the skin lesions resolved gradually, and dorsal epidermal thickness returned to normal by day 30 (Fig. 1C–E). Disease reoccurrence was not observed in any animal; however, the abdominal skin retained gross and histological lesions (Fig. 1D, 1E). Strikingly, mRNA coding for calcium-binding proteins S100A8 and S100A9, defensin B3, and cytokines IL-22, IL-24, and IL-1β were strongly upregulated in the epidermis of DKO mice (Fig. 1I), as they are in human psoriasis. Expression of the differentiation markers loricrin and keratin 10 were decreased in the skin of DKO mice (Fig. 1G, 1H); however, skin barrier function remained intact, as assessed by a Toluidine Blue skin barrier assay (data not shown). To further explore skin immune homeostasis, we performed flow cytometry on D16 tissues. We observed a 2-fold increase in the proportion of CD45+ leukocytes among total skin cells in DKO mice (Fig. 2A), which correlated with mononuclear cell infiltration (Fig. 1B). 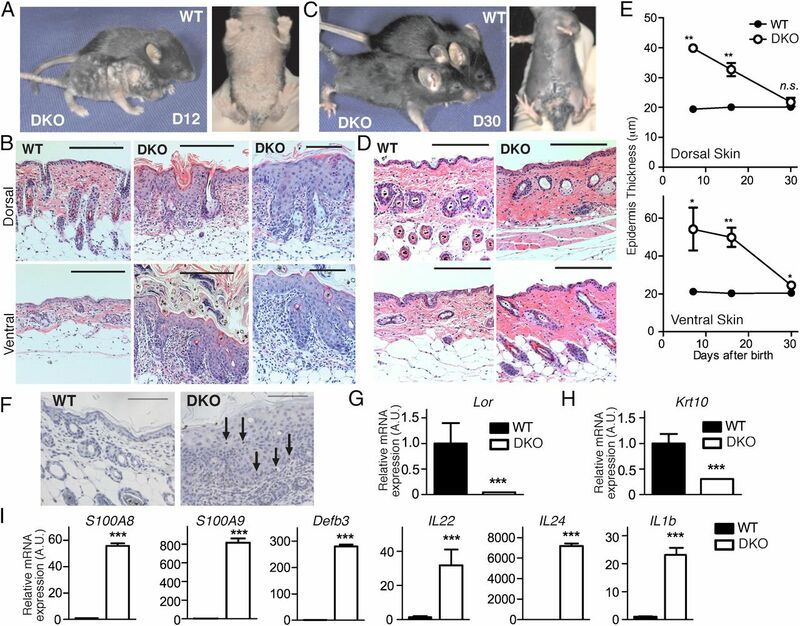 TCR-β+ T cells were increased in the skin of DKO mice (Fig. 2B). The CD4+Foxp3+ Treg proportion and number were dramatically enhanced, accounting for up to 60% of the skin-infiltrating CD4+ T cell compartment (Fig. 2C, 2D). We observed a 3–5-fold increase in the numbers of type II innate lymphoid cells, which were implicated in inflammatory responses in the skin (25), in both the LN and skin of DKO mice compared with wild-type (WT) controls (Fig. 2E, 2F). K14 is expressed by medullary thymic epithelial cells (26), which are important for Treg selection and deletion of autoreactive T cells (27). However, no changes were observed in medullary thymic epithelial cells or T cell subsets in the thymus of day-7 DKO mice (Supplemental Fig. 2). Thus, the dermatitis in DKO mice is likely due to a keratinocyte-intrinsic function of NF-κB. Together, these results indicate that canonical NF-κB in keratinocytes is required for their optimal differentiation, as well as maintenance of immune homeostasis in the skin. Skin leukocyte infiltration in DKO mice. Spleen, LN (inguinal), and whole skin from day-16 mice were analyzed by flow cytometry. (A) Percentage of CD45+ (leukocytes) among total live cells. (B) Numbers of CD45+TCR-β+ cells in 106 live cells. (C) Representative dot plot gated on CD45+TCR-β+CD4+ cells. (D) Numbers of CD45+TCR-β+CD4+Foxp3+ cells in 106 live cells. (E) Representative dot plot gated on CD45+TCR-β−TCR-γδ−CD19−CD11c−CD11b−NK1.1− (Lin−) cells. (F) Mean (± SEM) numbers of Lin− CD25+ST2+ cells in 106 live cells. Data are representative or cumulative of at least three independent experiments. *p < 0.05. n.s., nonsignificant. TNF contributes to chronic inflammatory diseases, including psoriasis, and anti-TNF treatments are a first-line treatment for moderate to severe psoriasis (28). Therefore, we asked whether TNF mediated the dermatitis of DKO mice. TNF mRNA was increased in the skin of DKO mice 7 d after birth (Fig. 3A). Injection of an anti-TNF mAb prior to the appearance of the symptoms strongly reduced skin lesions, epidermal thickness, leukocyte infiltration, and apoptosis compared with vehicle treatment (Fig. 3B–D, data not shown). These data definitively establish that TNF can drive psoriasiform dermatitis independent of activation of the canonical NF-κB pathway in keratinocytes. TNF blockade inhibits dermatitis. (A) Tnf mRNA expression in the whole skin 7 d after birth, as assessed by qRT-PCR. (B–D) WT and DKO mice were injected i.p. with 10 mg/kg anti-TNF (XT3.11; Bio X Cell) or vehicle (Ctrl) every other day from days 4 to 12 after birth. Mice were sacrificed at day 15. (B) Representative photographs of mice. (C) Representative H&E staining of ventral skin sections. Scale bars, 100 μm. (D) Mean (± SEM) epidermal thickness. Symbols represent individual mice; horizontal lines indicate the mean. All data are from one of two independent experiments. *p < 0.05. In contrast to K14creIKK2fl/fl mice (10, 13), DKO mice spontaneously begin to recover 3 wk after birth. This led us to explore the mechanism of “remission.” Because we observed a massive Treg expansion in DKO skin prior to remission, we tested whether Tregs contributed to remission by injecting an anti-CD25 Ab. This protocol achieved a 50% reduction in Foxp3+ T cells 2 d after treatment (Fig. 4A). 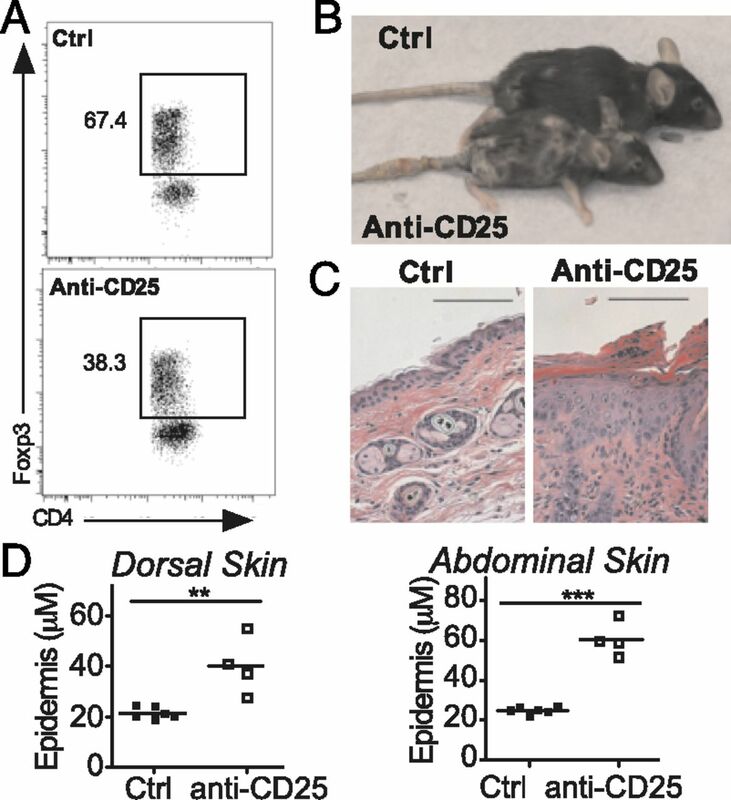 Treg-depleted DKO mice exhibited worsened pathology, with increased skin immune infiltrate (Fig. 4B–D). These results suggest that Tregs were necessary for disease recovery and highlight the role of Tregs in skin immune homeostasis. Treg depletion inhibits recovery of DKO mice. Three-week-old DKO mice received a single i.p. injection of 150 μg anti-CD25 mAb (PC61.5; Bio X Cell) or vehicle (Ctrl). (A) Representative Foxp3 staining in CD4+TCR-β+CD45+ gated cells. Numbers indicate the percentage gated. (B) Representative photographs of mice. (C) Representative H&E staining of ventral skin sections. Scale bars, 100 μm. (D) Mean (± SEM) epidermal thickness. Symbols represent individual mice; horizontal lines indicate the mean. All data are representative or cumulative of two independent experiments. **p < 0.01, ***p < 0.001. It was proposed that the pathogenesis of psoriasis may follow a two-step model. First, environmental and/or genetic factors drive keratinocyte dysfunction and production of chemokines or inflammatory cytokines; in turn, activation of immune cells, such as dendritic cells and macrophages, may trigger a strong T cell–dependent inflammatory response, leading to increased proliferation of epidermal cells and clinical symptoms. In this article, we show that perturbation of the canonical NF-κB in the epidermis can trigger cell death, immune infiltration, and hyperkeratosis. These data indicate that NF-κB supports skin immune homeostasis and may prevent uncontrolled TNF-dependent leukocyte recruitment and activation. We thank S. Gurunathan and V. Sisirak for comments and A. Oeckinghaus and T. Postler for technical help. This work was supported by grants from the National Institutes of Health (R01-AI068977 and R37-AI33443 to S.G.), the National Psoriasis Foundation (to M.S.H. ), and the Cancer Research Institute (to Y.G.-B.).
. 2012. Psoriasis. Annu. Rev. Pathol. 7: 385–422.
. 2014. IL-6 regulates neutrophil microabscess formation in IL-17A-driven psoriasiform lesions. J. Invest. Dermatol. 134: 728–735.
. 1992. Cachexia and graft-vs.-host-disease-type skin changes in keratin promoter-driven TNF alpha transgenic mice. Genes Dev. 6: 1444–1456.
. 2005. Stat3 links activated keratinocytes and immunocytes required for development of psoriasis in a novel transgenic mouse model. Nat. Med. 11: 43–49.
. 2007. Crosstalk between keratinocytes and adaptive immune cells in an IkappaBalpha protein-mediated inflammatory disease of the skin. Immunity 27: 296–307.
. 2012. NF-κB, the first quarter-century: remarkable progress and outstanding questions. Genes Dev. 26: 203–234.
. 2012. Current understanding of human genetics and genetic analysis of psoriasis. J. Dermatol. 39: 231–241.
. 1996. IkappaBalpha deficiency results in a sustained NF-kappaB response and severe widespread dermatitis in mice. Mol. Cell. Biol. 16: 2341–2349.
. 2002. 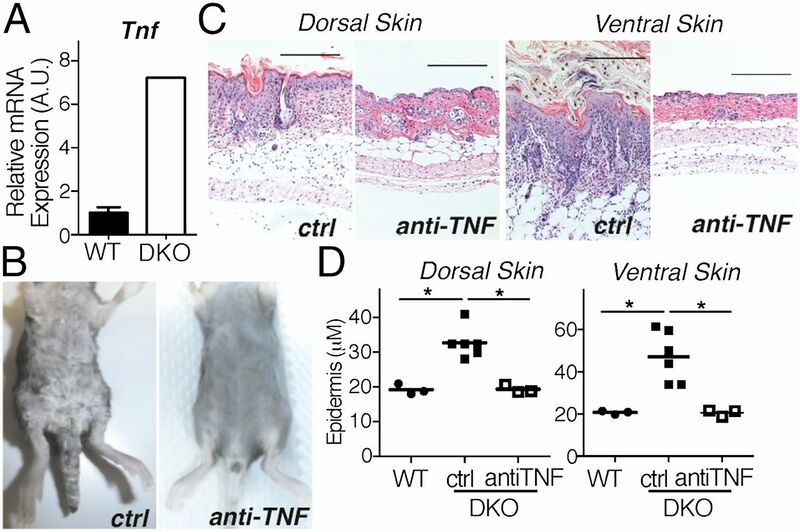 TNF-mediated inflammatory skin disease in mice with epidermis-specific deletion of IKK2. Nature 417: 861–866.
. 1999. Squamous cell carcinomas and increased apoptosis in skin with inhibited Rel/nuclear factor-kappaB signaling. Cancer Res. 59: 3299–3303.
. 2006. Pathogenic role for skin macrophages in a mouse model of keratinocyte-induced psoriasis-like skin inflammation. J. Clin. Invest. 116: 2094–2104.
. 2013. Tumor necrosis factor receptor signaling in keratinocytes triggers interleukin-24-dependent psoriasis-like skin inflammation in mice. Immunity 39: 899–911.
. 2013. IκBα beyond the NF-κB dogma. Oncotarget 4: 1550–1551.
. 2012. IκB kinase regulation of the TPL-2/ERK MAPK pathway. Immunol. Rev. 246: 168–182.
. 2008. An antiinflammatory role for IKKbeta through the inhibition of “classical” macrophage activation. J. Exp. Med. 205: 1269–1276. 2009. The NF-kappaB-independent functions of IKK subunits in immunity and cancer. Trends Cell Biol. 19: 404–413.
. 2000. Sonic hedgehog regulates growth and morphogenesis of the tooth. Development 127: 4775–4785.
. 2007. Pancreas-specific RelA/p65 truncation increases susceptibility of acini to inflammation-associated cell death following cerulein pancreatitis. J. Clin. Invest. 117: 1490–1501. Heise, N., N. S. De Silva, K. Silva, A. Carette, G. Simonetti, M. Pasparakis, and U. Klein. 2014. Germinal center B cell maintenance and differentiation are controlled by distinct NF-κB transcription factor subunits. J. Exp. Med. 211: 2103–2118.
. 2004. The transcription factors c-rel and RelA control epidermal development and homeostasis in embryonic and adult skin via distinct mechanisms. Mol. Cell. Biol. 24: 5733–5745.
. 2014. Epidermal RelA specifically restricts contact allergen-induced inflammation and apoptosis in skin. J. Invest. Dermatol. 134: 2541–2550.
. 1998. Alterations in NF-kappaB function in transgenic epithelial tissue demonstrate a growth inhibitory role for NF-kappaB. Proc. Natl. Acad. Sci. USA 95: 2307–2312.
. 2004. NF-kappaB RelA opposes epidermal proliferation driven by TNFR1 and JNK. Genes Dev. 18: 17–22. Kim, B. S., M. C. Siracusa, S. A. Saenz, M. Noti, L. A. Monticelli, G. F. Sonnenberg, M. R. Hepworth, A. S. Van Voorhees, M. R. Comeau, and D. Artis. 2013. TSLP elicits IL-33-independent innate lymphoid cell responses to promote skin inflammation. Sci. Transl. Med. 5: 170ra16.
. 2007. Thymus medulla formation and central tolerance are restored in IKKalpha-/- mice that express an IKKalpha transgene in keratin 5+ thymic epithelial cells. J. Immunol. 178: 829–837.
. 2012. Thymic epithelial cells: working class heroes for T cell development and repertoire selection. Trends Immunol. 33: 256–263. 2005. Psoriasis: emerging therapeutic strategies. Nat. Rev. Drug Discov. 4: 19–34.